When I was a young boy in the early 70’s, all the cheap toys were stamped “made in Japan.” A decade later that same stamp marked a seal of quality. As a young adult, I lived in a nation that boasted the best education system in the world, and superior healthcare that drew people to America. A decade later, approaching middle age, I settled for falling educational achievements and woke to a lumbering healthcare system that offered little care, higher costs, and no quantifiable standards. But alas, by the turn of the century, surely, we had mastered the “happiness” metric. We were the only superpower, enjoying a prosperity marked by a tech boom with low tax rates and a humming GDP. The USA meant innovation and produced gadgets that wowed the world. After 9/11, everything changed. Finances devolved. Trade unraveled. Transportation degraded. Media fragmented. Social tensions and alienation rose. Our national identity withered. I became a global citizen, not so much by desire as by necessity. It seemed necessary to view America through a wider lens. As I launched careers (in academia and consulting) that developed minds and worked with leaders, it became important to take a less certain view of the world or future. 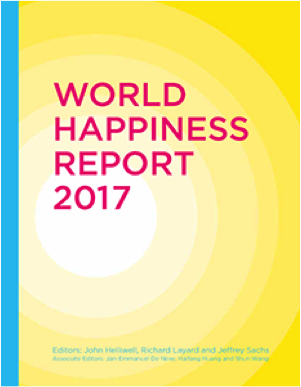 A decade later in 2012, the U.N. released the first annual World Happiness Report, measuring the state of Global Happiness. The U.S. entered at number 11 – its highest ranking ever. The Fifth Annual Report (2017) issued last week includes 155 countries and continues to gain global recognition. Governments, organizations and civil societies increasingly use happiness indicators to inform their policy-making decisions. The report’s winners have consistently included the Nordic nations. This year Norway took the top spot from last year’s Denmark. Consistently rounding out the top five spots with Denmark and Norway are Finland, Iceland, Switzerland. This year the Netherlands, Canada, New Zealand, Australia, and Sweden all tied for ninth place, well ahead of the U.S. at 14th place. We Manage What We Measure. Having become part of a global community, America can no longer unilaterally determine what matters, or what to focus on. Based on data collected by Gallup World Poll the Global Happiness Report is slowly shifting consciousness to highlight the elements of societal life that work well for humans; and that when measured, point to different priorities. Ironically, America’s economic success – focusing on GDP, tax breaks, trade policy, and financial deregulation –finds that our emphasis on economic drivers comes at the expense of recognizing the importance of social cohesion. The Happiness Report, however, includes a fuller view of life and satisfaction that embraces income, life expectancy, having someone to count on in times of trouble, generosity, freedom and trust, as measured by the absence of corruption in business and government. Life evaluation: a reflective assessment on a person’s life or some specific aspect of it. Affect: a person’s feelings or emotional states, typically measured concerning a particular point in time. Eudaimonia: a sense of meaning and purpose in life, or good psychological functioning. Additionally, these top-tier nations all leverage economic benefit to better their people. For instance, consider that Norway achieves and maintains its high happiness not because of its oil wealth, but in spite of it. Currently, oil prices remain weak in Norway, but by choosing to produce its oil slowly, and investing the proceeds for the future rather than spending them in the present, Norway has insulated itself from the boom and bust cycle of many other resource-rich economies. The report points to nations that maintain happiness, as ensuring high levels of mutual trust, shared purpose, generosity, and good governance — all factors that help to keep Norway and other top countries where they are in the happiness rankings. In 2007 the USA ranked 3rd among the OECD (Organization for Economic Cooperation and Development) countries; in 2016 it came 19th. The reasons are declining social support and increased corruption (chapter 7) and it is these same factors that explain why the Nordic countries do so much better. If we take a longer view, we can see that the end of the Cold War, and especially the advent of 9/11, confronted America with an identity crisis. Without Communism to rail against, what do we stand for? Each subsequent war caused confusion. As part of a global community, what is our role? Climate change, trade, and globalization presented more confusion. We persisted in our exceptionalism, clinging to an identity that blinded us to what made America exceptional. The brilliance of America was our ingenuity. We excelled at learning from and integrating peoples from other nations. We developed education and governing principles from the British; leveraged scientific thought from Europeans; borrowed artistic culture from France and Italy; philosophy from the French and Germans; and bested Japan’s total quality revolution. After the fall of the Soviet Union, we became the last superpower standing, militarily and economically. This found us right, good and true – and complacent. We stopped learning from others. America now ranks 17 in Education performance; 44 in Healthcare Efficacy, 15 in Perceived Press Freedom. We rank an unimpressive 38th out of 71 countries in math and 24th in science. On Child Well-Being the U.S. ranks 26th; Literacy, 24th; Freedom from Corruption, 24th; Gender Equality, 22nd; and Economic Freedom, 10th. Of the nations ranked ahead of America in the Happiness Report, only America views healthcare as a privilege, not a right. Reliable healthcare impacts citizens not only individually but in our ability to care for loved ones and close friends and count on a system to strengthen bonds. No other indicator can create more anxiety, especially when – as Made in America – healthcare is so linked to private capital, both in its purchase (through employers) and its access (through for-profit enterprise). These social tensions include the economic divide between those with and those without a college degree; the fight for a living wage, basic healthcare with prescription drugs, and the challenge of assimilating new technologies, and cultural progress. For instance, the report notes that while unemployment causes a major fall in happiness, that even for those working, the quality of work can cause major variations in happiness. If we are serious about Happiness as a measure of achieving human potential and creating a successful society, we need to remember our own climb as a people and as a nation: to learn from others, and ask the confronting question: Why aren’t we #1? This is the America of previous generations. Let’s celebrate and recognize that our success in education, business, and even democracy, has spawned emerging nations and societies who are solving tomorrow’s problems not resting on yesterday achievements. They’ve stepped up, reached out, and are beating us at our own game. These sentiments are also echoed by George Bernard Shaw. Education can play a central role in shifting our priorities. And as a people, the Happiness Report reveals the possibility of happiness when we focus beyond individual or economic prosperity to those conditions that foster societal satisfaction. Here, business and government can play a central role. These shifts require leaders who are willing to learn newly. At some point, all great teachers become better learners. We dig in and learn from those leaping ahead of us. Can business, government, and political leaders adopt a fuller view human happiness beyond GDP, dogma, and outmoded worldviews? Can we examine the nations ahead of us, their policies, culture, and wisdom and embrace new best practices? Do we have it in us, as a people and nation to once again ask, what does it take to be #1? Let’s put America’s ingenuity to the test.